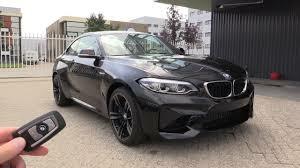 Obtaining the highly coveted 2018 BMW M2 in some places can take as long as 6-12 months. It can be difficult, as we explained to our client. He understood and accepted it. Well, that’s true ‘in some places,’ but not at the Serpa Automotive Boutique. Less than a week later, we sent him this video, showing how our enclosed trailer service ensured no damage in transportation. It’s just one of many services in our concierge program. Here comes the twist – are you ready for it? Our client lives in Portland, Oregon for half the year. The original plan: the M2 arrives in summer. So, let’s break down this scenario. M2 arrives in winter, but it’s not available until you return home in the spring? Well, that doesn’t work, we all know that. The outcome: the M2 on route to Portland in the enclosed trailer. Serpa Automotive Boutique prides itself in getting you behind the wheel faster than anyone ever expects. In this case, over six months early — and with top-notch service. The M2 (365 hp, 0-60 mph in 4 seconds) will arrive at his doorstep, plated, detailed and ready to drive and enjoy.